A Simon Fraser University study has found that steelhead trout have a remarkable life-cycle variation that responds to changes in temperature and numbers of other species of salmon. They may go to the ocean when they are only a year old and the size of a pinky finger, or when they are five years old and the size of a standard ruler. The study appears this week in the journal Ecosphere. 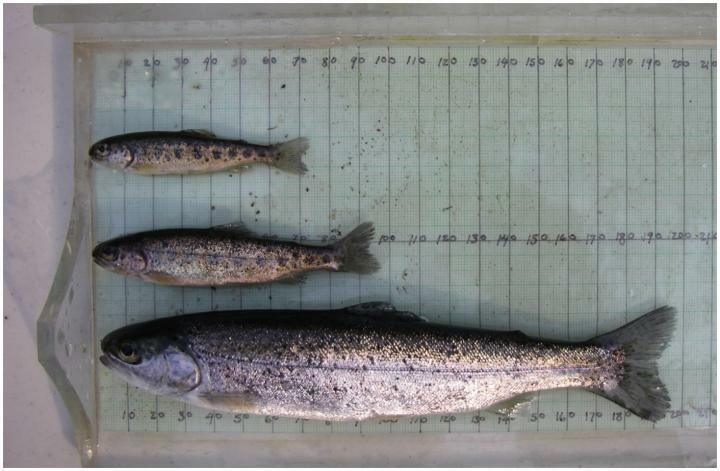 Researchers found that the steelhead trout age of migration, as well as their size and numbers, is controlled by a combination of temperature, co-occurring salmon, and other factors. In years following large returns of pink salmon, steelhead migrated to sea at a younger age, and in some time periods, there were more young steelhead that were produced from the river system. "We think that energy-rich eggs from spawning pink salmon provide an important food source for young steelhead," says SFU biology PhD student Colin Bailey, who is leading the project. SFU biology professor John Reynolds, a study co-author, also chairs the Committee on the Status of Endangered Wildlife in Canada (COSEWIC), the federally-appointed independent committee that assesses the status of species of plants and animals across Canada. He notes: "Many populations of steelhead are struggling, so the insights gained into their population dynamics can be helpful for conservation." Bailey adds: "It's complicated–these fish seem to be controlled by many different factors at different times. We looked back through time and asked the data: do weather, spawning pink salmon, and other factors affect the steelhead life cycle?" Next steps include examining how the survival of steelhead in the ocean is influenced by their size and age at entry to sea. This will allow researchers to determine If there are lasting effects of steelhead rearing conditions on their chance of returning to spawn. Bailey says the research results are made possible because of a remarkable long-term field program on the Keogh River on northern Vancouver Island. Since the early 1970s, a collaboration between the Department of Fisheries and Oceans Canada, British Columbia Ministry of the Forests, Lands, Natural Resource Operations and Rural Development, and Instream Fisheries Research resulted in four decades of salmon and trout monitoring in the Keogh River. More information is available at https://www.keoghriver.net/.